InSphero AG, the leading provider of 3D cell culture technology, assay-ready 3D microtissues, and 3D-focused contract research services, was recognized last Tuesday as winner of the 2014 ACES Life Sciences Award. The pan-European award recognizing enterprise in university and public research institutes was announced October 7th in Berlin, Germany. The award marks the second such honor in three weeks for InSphero, after having been named the #1 Swiss Startup in the Top 100 Swiss Starup Rankings on September 18th. Founded in 2009 in Zurich, Switzerland as a spin-off of the Swiss Federal Institute of Technology (ETH) Zurich and the University Zurich, InSphero now also operates commercial offices in Germany and the United States. InSphero’s 3D InSight™ human and rat liver microtissues are used for in vitro toxicity and safety testing, and the company recently added novel 3D pancreatic microislets, a spheroid imager, and an optimized cytotoxicity assay kit to its portfolio of 3D-focused products and services. The ACES awards program was created in 2008 by Science|Business, a Brussels- and London-based media company and innovation network set up to recognize entrepreneurship at academic institutions. The ACES 2014 winner’s conference was held in Germany at the Technical University Berlin. 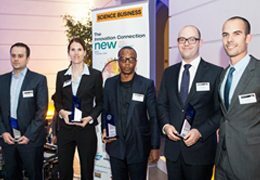 The winners were chosen by the Science|Business Innovation Board from a shortlist drawn up by a jury drawn from academia, industry, and venture capital. InSphero is a leading supplier of organotypic, biological in vitro 3D microtissues for highly predictive drug testing. The company, headquartered in Zurich, Switzerland, with subsidiaries in the USA and in Germany, currently counts all of the top ten global pharmaceutical and cosmetics companies as customers. InSphero 3D Insight™ Microtissues enable more biologically relevant in vitro applications in efficacy and toxicology. The spin-off company of the Swiss Federal Institute of Technology (ETH) Zurich and the University Zurich has been recognized for its scientific and commercial achievements with a number of national and international awards, including being named both the #1 Swiss Startup and ACES Award Winner for 2014. InSphero is certified to the ISO 9001:2008 standard for its Quality Management System. Melanie Aregger (second from left) of InSphero AG accepted the 2014 ACES Life Sciences Award in Berlin, Germany on October 7th, 2014. The pan-European ACES awards recognize enterprise in university and public research institutes.